"Maya: Hidden Worlds Revealed" is in Milwaukee until May 28. Published Feb. 12, 2018 at 1:02 p.m.
Milwaukee Public Museum just opened its latest traveling exhibition this week and it covers some familiar ground. "Maya: Hidden Worlds Revealed" is the largest exhibition about the ancient Maya ever to be displayed in the United States. 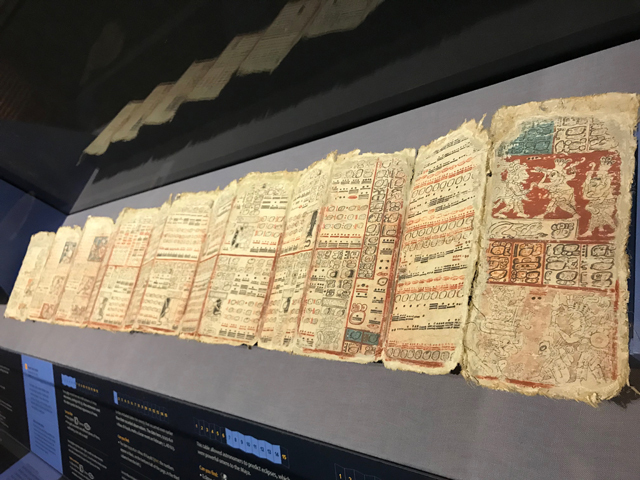 The museum also hosted a big Mayan exhibit in 1987, but in terms of Mayan scholarship, 1987 is ancient history, according to Carter Lupton, the museum's curator emeritus of, well, ancient history. "When I was a student in the 1970s, you couldn't read most of the Maya glyphs," Lupton said as he walked me through the exhibition while the final touches were being made. "They used to say all these people depicted on these stelae are priest kings. They didn't know the names. They didn't know when they lived. They thought everything was calendrical, that the only thing they could really know were dates." It turns out, thanks to advances made in decoding the long-mysterious Mayan symbols, Mayan history – or what we thought was Mayan history – has been rewritten in the past few decades. "We'd not had most of this information," Lupton said. "You could've shown the pieces, but you couldn't have said much about them. This changes everything. The most recent estimates are that about 90 percent of the original glyphs can be read and understood. So we're still learning more, but it's still improving and moving forward." 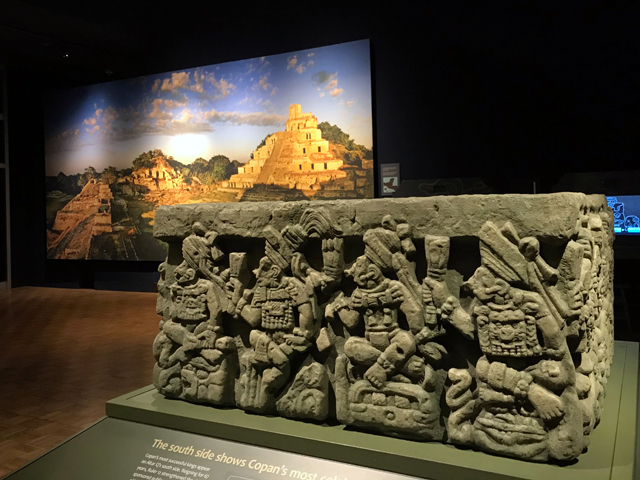 Unlike the 1987 show here – which focused on Chichen Itza in Mexico – "Maya: Hidden Worlds Revealed" aims to paint a much more encompassing picture of Mayan history and culture. "This is much broader," Lupton said. "All of Maya history, all of Maya geography, is being covered in one way or another. A lot of the individual objects here are from Belize, which is a small country, but a huge country for the Maya. It's got as many major Maya sites as Guatemala or Mexico, or you name it. It's very important." A delegation of Belizians arrived in Milwaukee last week for a VIP preview event on Thursday night, Lupton added. 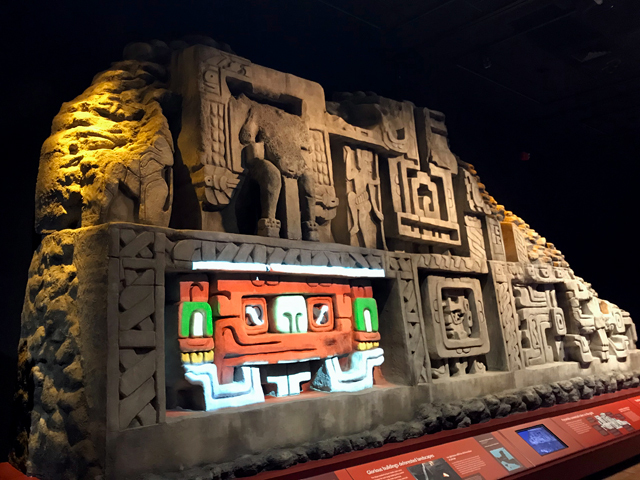 The exhibition uses a wide variety of means to tell the story of the Maya, from towering replicas of stone stelae, to a recreated burial tomb, to original artifacts, to colorful explanatory panels (in English and Spanish), to videos and hands-on elements, too. Dramatic lighting helps create an evocative setting for the show, too. 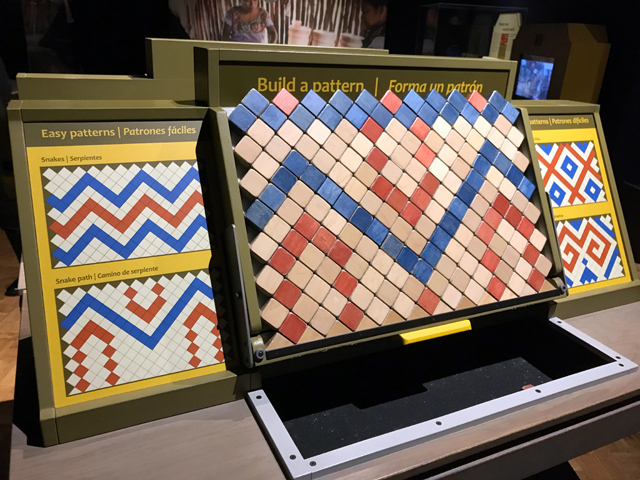 "This was put together by the Science Museum of Minnesota in Minneapolis," said Lupton. "They worked with some of the museums in Denver and in Boston, I believe, putting it together, but we've had a long association with that museum. We did (the Maya) exhibit here in '87, that I worked on. We have a history of working with them. They build great traveling exhibits." 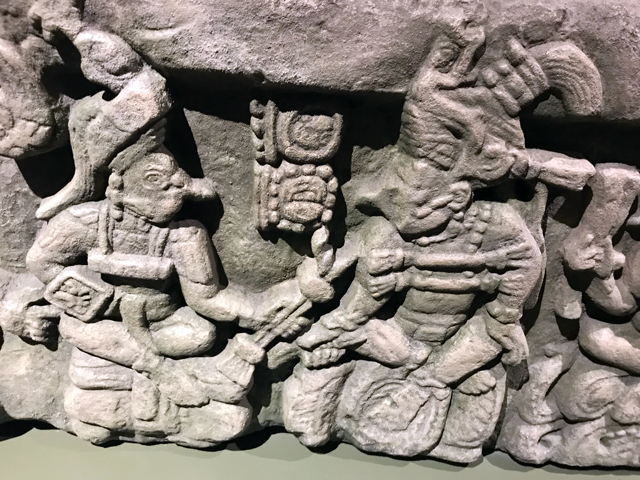 "Maya Hidden Worlds Revealed" runs through May 28, and while you're there, don't forget to head upstairs and check out the Milwaukee Public Museum's own collection of Mayan objects. "Dr. Stephan Borhegyi, who was the director here from 1959 to 1969 ... was a Mayanist," Lupton said. "His specialty was Maya archeology. 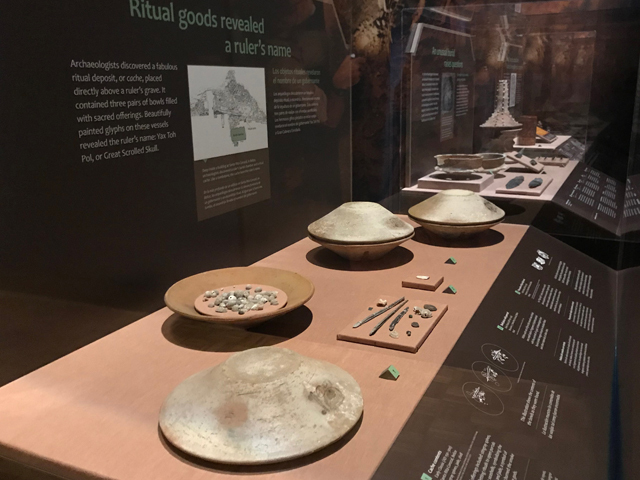 He studied the ancient Maya ballgame – there's a whole section on the ballgame in this exhibit – and another aspect of the archeology called mushroom stones. So we have a lot of those on exhibit upstairs. "He also did underwater archeology at a place in Guatemala called Lake Atitlan. He did underwater archeology with divers, and they would go and bring up all these things. There's a little part of that in our permanent exhibit up on the mezzanine. We do have this fairly long connection and good collections in some areas, but that wasn't maintained throughout the years. But 50, 60 years ago, we did have an early connection." One of the most interesting sections of "Maya: Hidden Worlds Revealed" comes at the end, where we learn about Mayan culture today. There's information about their clothing and weaving techniques, as well as farming techniques and crops, many of which are rooted in the ancient Mayan culture, Lupton said. I asked Lupton if today's Mayans maintained their knowledge of the glyphs and language across the generations. "They didn't until recently," he said, "but now through working with some of their elders and also with archeologists and epigraphers who have been studying this, they're trying to reintroduce this among the modern Maya, among the younger generations. Just as there are many ancient Mayan dialects, I think they're trying to incorporate some of the writing system itself, the art styles. "There are different cooperatives here and there that make crafts," he added. "You go Guatemala or Belize today, half of the stuff you can buy in a modern bazaar is made by living Maya in patterns that are reminiscent of ancient patterns." Admission to "Maya: Hidden Worlds Revealed" is via a timed ticket that includes general museum admission. Tickets are $25 for adults, $18 for seniors and $16 for kids ages 5-12. Children under 4 are admitted free.